CSS developed a guidance document for EPA's National Risk Management Research Laboratory for designing monitoring networks to measure the effectiveness of natural attenuation processes to achieve site-specific remediation objectives. Specifically, the document focused on monitored natural attenuation (MNA) remediation of chlorinated solvents and common fuel-related aromatic compounds dissolved in groundwater within a porous media. 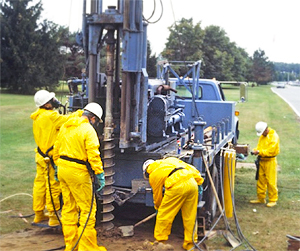 CSS provided guidance on making site-specific decisions regarding monitoring parameters, number and location of monitoring points (i.e., the three-dimensional monitoring locations relative to the plume), monitoring frequency, and methods to analyze and interpret the data obtained from the monitoring points. Data interpretation focused on detection of spatial and temporal changes, and assessment of their impact on the achievement of site-specific remediation goals.